Nintendo Octopath Traveler Nintendo Switch Game​ Step into the shoes of a traveller to inherit their struggles and strengths. Use each character’s special abilities to interact with the world and enhance your tactics in turn-based battles. The Dancer’s alluring charm leads followers into battle, whereas the Apothecary can mix items to heal allies or unleash explosive attacks. Discover enemy weaknesses and target them to break through their defences. Store Boost Points with each turn and then spend them at strategic times to strengthen abilities, chain attacks, or provide aid. Choose the path you wish to walk and discover what lies beyond the horizon. 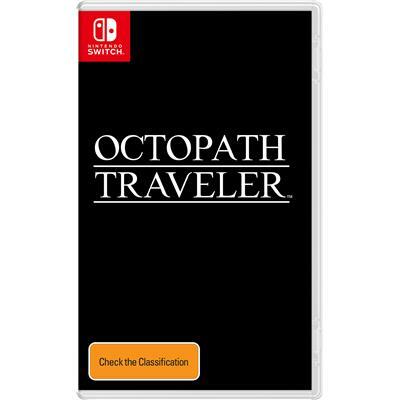 The Nintendo Octopath Traveler Nintendo Switch Game was added to the Nintendo Switch Games category in March 2018. The lowest price GetPrice has found for the Nintendo Octopath Traveler Nintendo Switch Game in Australia is $69.99 from Amazon AU.